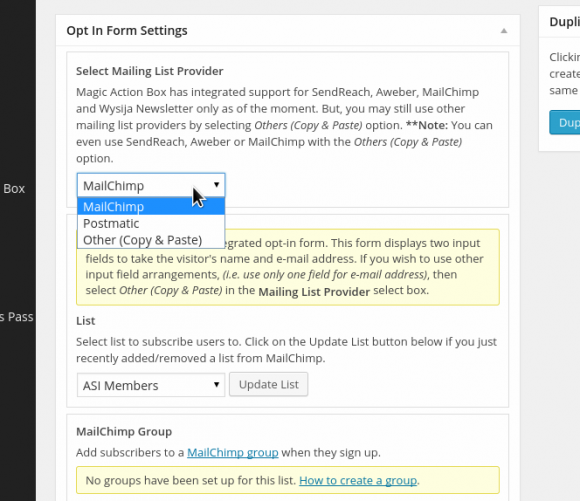 Starting with version 2.16, you can now specify a MailChimp group for users to get added to when they sign up using the built-in MailChimp optin form. MailChimp groups allow you to easily segment your subscribers based on their interests and allow you to send targeted email campaigns. To start, you need to connect your MailChimp account with Magic Action Box. You will also need to create interest groups in your MailChimp list. Here’s the official how-to from MailChimp. Once you’ve done that, create a new action box and choose Optin Form as your action box type. Or you can edit an existing one. You should be taken to the action box edit screen. In the Opt In Form Settings section, look for the Select Mailing List Provider dropdown and select MailChimp. Next, go to the List dropdown and choose the mailing list that has interest groups added to it. 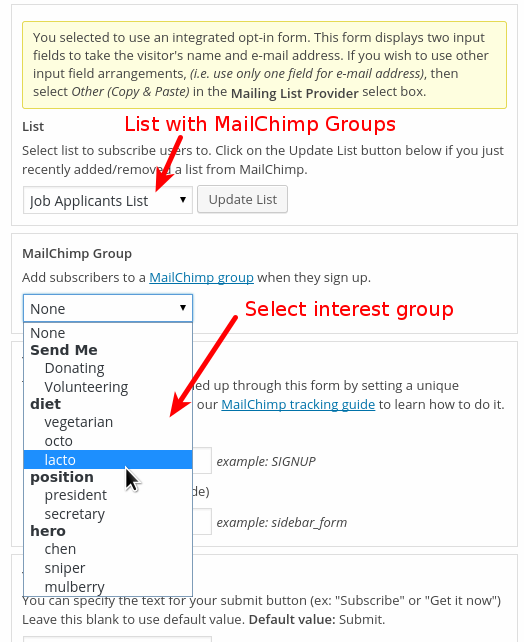 The MailChimp Group setting box should update and now show the different interest groups you created in MailChimp. Choose the interest group that you want users who sign up with this opt-in form to be added into. Now, when you deploy this opt-in form, users will automatically be added to the group you specified when they sign up. You will of course probably want to create multiple opt-in forms with different groups assigned to them and add the different forms to targeted pages.